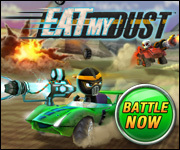 Apply the break to your need for speed – Eat My Dust will be down for scheduled maintenance for at least 6-8 hours, this Sunday, August 24th, at 9PM PST (Pacific Standard Time)! Wrench and our team of top mechanics will be working to improve the performance of your game. Stay tuned for more updates before you race on over to our online world!